This article is about women's one-piece swimwear. For other uses, see One-piece (disambiguation). Five-time Olympic gold medalist Missy Franklin (of USA) in a one-piece swimsuit. A one-piece swimsuit most commonly refers to swimwear worn by women and girls when swimming in the sea or in a swimming pool, or for any activity in the sun, such as sun bathing. Today, the one-piece swimsuit is usually a skin-tight garment that covers a female's torso, except maybe the back or upper chest. Before the popularity of the two-piece swimsuit, and then the bikini, virtually all female swimwear completely covered at least the wearer's torso, and men also wore similar swimsuits. While the bikini has increasingly found popular acceptance since the 1960s, the one-piece swimsuit has maintained a place on beaches to this day. Some people consider a one-piece swimsuit to be more modest than a two-piece bikini. In some situations, the wearing of a one-piece swimsuit may be mandatory or expected, as in the case of school swimming events and international swimming events. The most common type of one-piece suit is the maillot (a term that is not generally used any more) or tank suit, which resembles a sleeveless leotard or bodysuit. There are variants of the one-piece swimsuit, including halterneck styles and plunge front swimsuits, as well as wrap-round ("surplice") and bandeau styles. The pretzel suit is another style of the one-piece swimsuit. Recently, athletic swimsuits have used a variety of new shoulder strap styles, including the racerback, fastback, and flyback styles, some of which have also been used on other athletic wear. Another recent innovation in one-piece swimsuits is the bodyskin, which superficially resembles a unitard or wetsuit. Although these cover the entire torso, arms, and legs, their function is not modesty, but reducing friction through the water for professional swimmers. Their surfaces are made of textured technical fabrics which are engineered to cut through the water in the same way as fish or shark skin. The modern one-piece swimsuit made its appearance in the mid-1900s, when the style was widely described as a maillot. 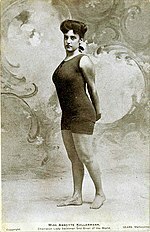 Its widespread acceptance is attributed to Australian swimmer Annette Kellerman, who attracted further attention to the style when, in 1907, she was arrested on a Boston beach for indecent exposure because her swimsuit showed arms, legs and the neck, a costume she adopted from England, and which was similar to men's swimsuits of the time. The arrest prompted a wide public outrage which added to the acceptance of the style. Kellerman marketed these bathing suits and the style came to be known as "the Annette Kellerman". The one-piece swimsuit became accepted swimsuit attire for women in parts of Europe by 1910, and other places, and was the authorised attire for women's swimming at the 1912 Summer Olympics, the first at which women competed. Harper's Bazaar praised the Kellerman swimsuit, writing in June 1920 (vol. 55, no. 6, p. 138): "Annette Kellerman Bathing Attire is distinguished by an incomparable, daring beauty of fit that always remains refined." The following year, in June 1921 (vol. 54, no. 2504, p. 101), it wrote that these bathing suits were "famous ... for their perfect fit and exquisite, plastic beauty of line". In the United States, beauty pageants of women in bathing costumes became popular from the 1880s. However, such events were not regarded as respectable. Beauty contests became more respectable with the first modern "Miss America" contest held in 1921, though less respectable beauty contests continued to be held. Nevertheless, the Annette Kellerman continued to be considered by some as the most offensive style of swimsuit in the 1920s and became the focus of censorship efforts. Even in 1943, pictures of the Kellerman swimsuit were produced as evidence of indecency in Esquire v. Walker, Postmaster General. During the 1920s and 1930s, people began to shift from "taking in the water" to "taking in the sun", at bathhouses and spas, and swimsuit designs shifted from functional considerations to incorporate more decorative features. Rayon was used in the 1920s in the manufacture of tight-fitting swimsuits, but its durability, especially when wet, proved problematic, with jersey and silk also sometimes being used. By the 1930s, the necklines of women's swimwear plunged at the back, sleeves disappeared, and sides were cut away and tightened. With the development of new clothing materials, particularly latex and nylon, through the 1930s, swimsuits gradually began hugging the body, with shoulder straps that could be lowered for tanning. Since the 1960s, the bikini has increasingly found popular acceptance, though the one-piece swimsuit has maintained a place on beaches to this day. Heim's two-piece has fallen out of fashion. In some contexts till today, a two-piece swimsuit is still regarded by some as immodest and controversial, with a one-piece bathing suit being mandatory, as in the case of most school swimming events. Olympic women's swimming and other international swimming events still prohibit the wearing of two-piece swimsuits. ^ "Vanities". .assumption.edu. Retrieved 2013-06-15. ^ Meagan Hess. "Skirting the Skirts at the Bathing Beach". Xroads.virginia.edu. Retrieved 2013-06-15. ^ Sydelle, John. "The Swimsuit Industry". The Houston Chronicle. Retrieved August 29, 2013. ^ Kadolph, Sara J. & Langford, Anna L. (2001). Textiles (9 ed.). Prentice Hall. ISBN 0-13-025443-6. ^ "Vintage Swimwear Timeline". Glamoursurf.com. Retrieved August 29, 2013. ^ "History of the Bikini". Carnival. This page was last edited on 24 April 2019, at 08:19 (UTC).